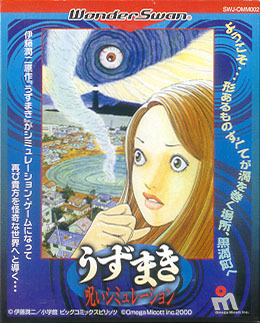 This game, based on Uzumaki, was released for the black&white version of the handheld	WonderSwan game machine shortly after the release of the Uzumaki movie. Reviews on Japanese game review sites such as this one suggest that it is a very poor game (which progresses dispassionately without conveying any fear or menace). I haven't played it (yet), but it can be bought heavily discounted for around 980 yen new. WonderSwan units are also very cheap. I do like the cover art. [after receiving the game] Unfortunately the game really does have very little to recommend it - it follows the plot of the manga very closely but has few pictures which are all, of course, limited by the resolution of the WonderSwan, and it also has almost no music. I couldn't recommend this game to anyone except the most uzumaki-mad. I bought my copy from famicom plaza online (famicom plaza)) for 980 yen, and there appear to be 3 copies left still. Another place to look might be here, where they also seem to have WonderSwan units. 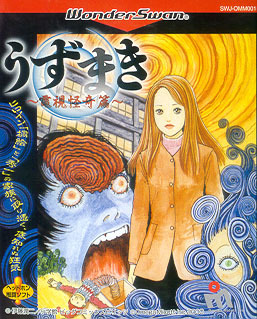 This game, based on Uzumaki, came out shortly after the other WonderSwan Uzumaki game. As far as I can tell, the object of the game is to collect items so that you can set curses while the whole time raising the 'uzumaki' factor (????). A review on this web site gives the game 4/10 for fear factor, 10/10 for humour, 7/10 for difficulty, a weird factor of 10/10 and an immersive score of 9/10. The author of that review says that he played for 3 hours nonstop (is that long?) and felt that the game had captured him much the same way the 'spiral madness' effects the characters in the manga and movie. I will be ordering my copy shortly.... [after receiving the game] Not a great game, but it is pretty fun. Unlike the electronic novel, this one is actually interactive, has decent music and a sense of humour. I don't know where to order it from, though, since I seem to have bought famicom plaza's last copy (at 980 yen). Other copies are available here (new @680 yen). A google search for "uzumaki noroi simulation" reveals that the game's ROM is now widely available on the net.